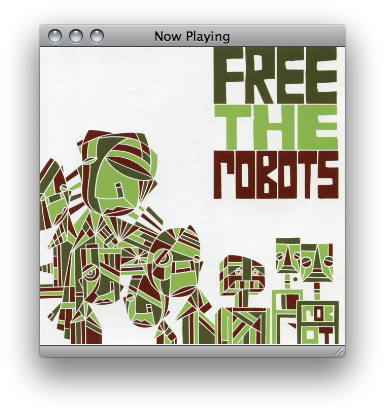 listen: free the robots. . . | andrewANDORU. . .
Where has this been all my life? I don’t know what the deal is this winter, but I am finding new great music every single day, often multiple times a day. Best remix I have ever heard. . ? Listen to this remix, then check out the rest on iTunes (link will open iTunes). Then do whatever you can to see a live show. And let me know when your going. . . It is incredible how all of the things I like start to connect to each other, music, animation, people with similar tastes seem . . . not gravitate towards one another, just float around relative to one another, watching and influencing, and creating where best needed. [iTunes] – for listening or purchase purposes, BUY IT! $5 that you probably would have spent on a hamburger or something dumb like that. Remember, iTunes Plus.